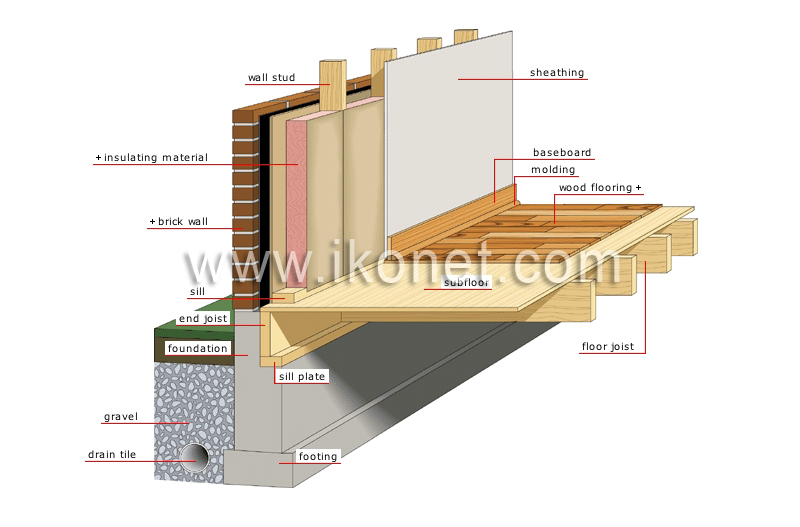 Plank of wood protruding from the base of a wall; it covers the joint between the floor and the wall. Finishing molding attached to the baseboard where it meets the floor; its cross-section is a quarter circle. Perforated pipe draining water from the soil; it also protects the foundation from frost and pressure caused by wet soil. Bed of small stones absorbing smaller particles found in water to prevent them from blocking the drain; it also keeps the drain in place. Level member to which the bottom ends of the studs are attached. Material impeding heat loss to the outdoors or the cold from entering. Exterior facing of a frame usually composed of blocks made from baked clay. Vertical member used in walls to support the double plate; the facing is attached to it.